December 23 is a mixed bag of emotions for me. Two years ago we had a happy memory as Tucker officially became Tucker Simpson Leeper when we picked him up from Ivywest. Suffice it to say, our lives have never ever been the same. 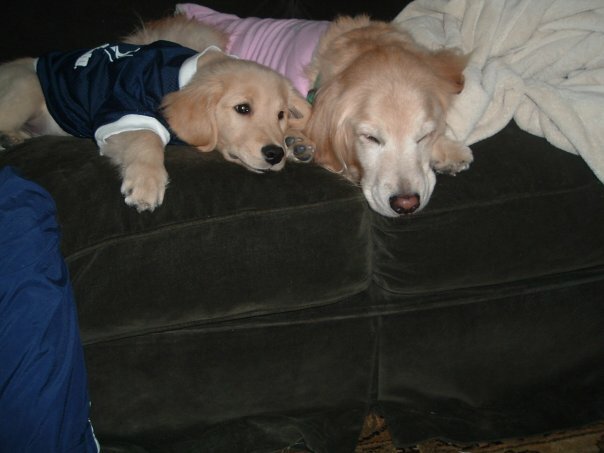 Last year, we had a sad memory as my parent’s golden retriever, my “little sister” Emily went to the rainbow bridge. I’ve written about Emily a lot on this blog and the impact she’s had on our life and really debated writing about her again but in addition to being a crazy dog mom, I’m also a crazy dog sister. So, Emily, here’s to you. Growing up, I didn’t have a dog. Instead of babysitting kids, I made money petsitting our neighbors dogs. Kids, that’s where the $$$ is at! I’m sure life was just too busy for us to have a dog so I just made every dog in our neighborhood mine. As a senior in high school, we became familiar with the Susquehanna Service Dogs (SSD) and my mom started to research this amazing organization. Emily came into our family as a 7 week old puppy via the Susquehanna Service Dogs in July 2001 (sorry, while we have lots of Emily puppy photos, we need to work on getting them digitized!). My mom and I MAY not have told my dad that we were getting a dog until right before Emily came. I mean, Emily was a service dog in training. You could take her everywhere! Why did he need to know? He wasn’t as into the idea as we were, but you know what ladies and gentleman? Dads don’t need to be in the know about everything. When he met Emily, he didn’t want to call her by her name at first, didn’t want to bond with her as he knew the service dog process. I can’t say I blame him but #Ridiculous. Of course, Em saw right through his nonsense and zeroed in on him from Day 1. More on that later. Now, Emily and her sister Charlotte (who was raised by a dear friend of ours) were a bit of an experiment for SSD. 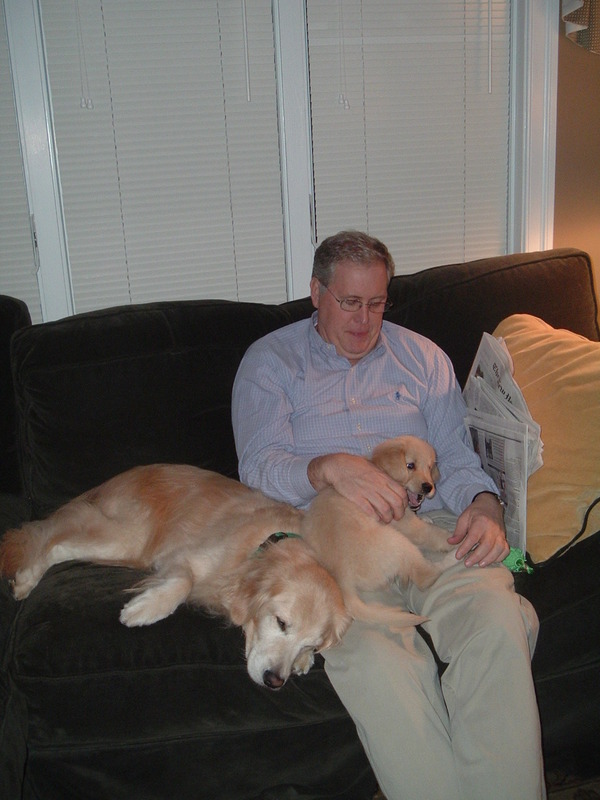 At the time, they had used mainly labs and they wanted to try some more goldies. 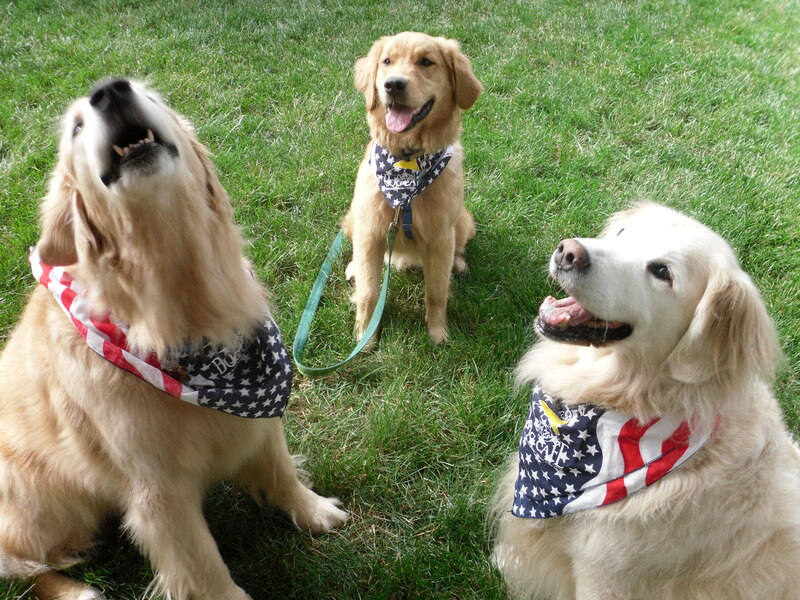 Many dogs, regardless of if they are labs or goldens or other breeds make wonderful service dogs and we are so so grateful to those dogs who help people every day and for organizations like SSD and their volunteers who work tirelessly to train those dogs. Emily went in for advanced training and well, to put it nicely, was told her services would be better used in another capacity. For the record, Charlotte was also discharged honorably from the program so it just wasn’t that we were poor trainers. Perhaps it was because Emily misunderstood the word service dog and thought we were all here to service her. Emily came back to our family (a call was made to my parents asking if they wanted their girl. I’m not sure my parents have ever moved that fast in their life). 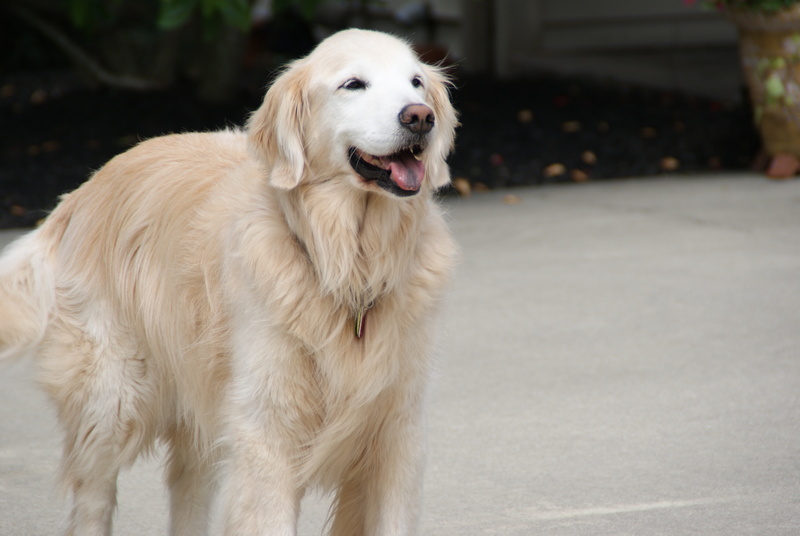 Emily lived a wonderful life and was 13 years old when she passed away. She may not have been a service dog, but she was spectacular at knowing when people and dogs needed comforting. 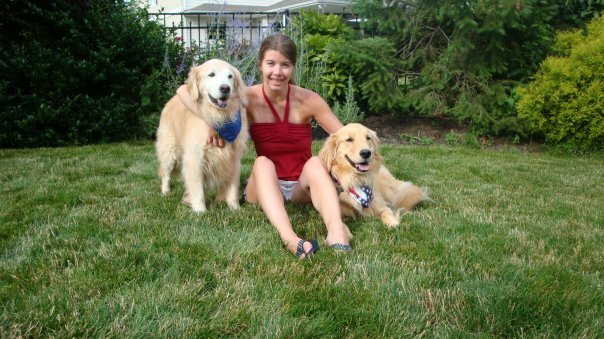 She became a therapy dog and would visit Penn State Hershey Medical Center. She was a tireless advocate for the UPS and the USPS, always diligently looking out for their trucks and getting treats. She was great with a tennis ball. She was a political force- she had to have a mole removed in the fall of 2004 that required her to wear a shirt so she wouldn’t mess with her stitches. She wore a Kerry/Edwards shirt to promote the Democratic candidates (sorry Johns). After that, she would wear her VOTE bandanna on election days. She loved college- going to Penn State to visit us at school and getting her pizza crusts on her walks. She always had a kind greeting for everyone that walked in our house- be it a family member, repairmen (her favorite! ), or another dog. She also led a double life as we’d go out walking and people knew her who we had never met. He may have had Spenser on his lap, but Emily was never far from him. Most of all though, she was loyal. She loved her family more than anything and we loved her more than anything. That Dad who didn’t want to call her by her name? Well, he became her number 1. Sure, she loved everyone but she had the most special place in her heart for her daddy. If he left the room, she left the room. If he packed his suitcases for a trip, she did her best sad face expression. She was never far from him and when he needed her when recovering from heart surgeries, joint replacements, etc, she was there, not leaving his side and he was there for her. We were devastated when she left us last year, but I firmly believe (and here’s the crazy coming out) that she made sure we were all together at Christmas when she decided to go. Tucker was there to comfort her little brother Spenser who had never lived without her and we were all there to help each other grieve–and because she was a bit of a diva, talk incessantly about her. Emily was a Simpson- we never do anything half-assed (well sometimes maybe we do) so she was going to go out with a bang. She even made sure my parents found the perfect pup to be with Spenser after she passed away, adopting DVGRR Oliver a few months later who is a bleach blonde like Emily was and displays many Emily-isms. I miss her every day, but every day I am reminded of her. Whether it be a pizza crust on the sidewalk or something Tucker does that reminds me of her, I know she is with us, and when she isn’t with us, I know she’s having a grand time playing with her siblings and friends in doggie heaven.